I have a confession. I didn't make this cheesecake yesterday, or even this past week. I made it a few years ago. The reason that I am posting it today is because yesterday was Pi day (3-14). Social networks and blogosphere alike were abuzz with happy Pi-related revelry. So all day I was assaulted with a nagging desire for pie or cake (which I like better than pie). Or cheesecake, which is kind of like cakepie in my mind, because it has a crust and a semi-solid filling. I would try to attempt to do something productive and my stomach would pipe up, "Hey, shouldn't you be making nummies?" "No," I'd tell it. "I'm teaching my child to read." "BUT I WANT CAKEPIE NOM NOM!" "NO! Eat a banana for crying out loud." Later..."Caaaaaaaaake. Pieeeeeeee. Waaaaaaaaaaaant." "Stop it, I'm making a delicious pasta dinner which you will enjoy with nutritious salad." "With sprinkles?!" "No, with Parmesan." "BOO! WANT CAKEPIE!" I could go on. I'd have clean downed a Funfetti monstrosity if one was before me. I wish I could say it's all good this morning. But even just having had a big bowl of mini wheats, I'm sorta hankering for some cake. Or pie. Or cakepie. I'll probably have to settle for looking at these pictures. This recipe doesn't need much of an explanation. It is dramatic to present and absolutely loaded with calories. And if you like peanut butter cups, there's pretty much no greater indulgence. In a bowl, combine the cracker crumbs, sugar, cookie crumbs and butter. Press onto the bottom and 1 in. up the sides of a greased 9-in. springform pan. Place on a baking sheet. In a large bowl, beat the cream cheese, sugar and sour cream until smooth. Add eggs; beat on low speed just until combined. Stir in vanilla. Pour 1 cup into a bowl; set aside. Pour remaining filling over peanut butter layer. In a microwave-safe bowl, heat 1/4 cup fudge topping on high for 30 seconds or until thin; fold into reserved cream cheese mixture. Carefully pour over filling; cut through with a knife to swirl. Microwave remaining fudge topping for 30 seconds or until warmed; spread over cheesecake. Garnish with peanut butter cups. Refrigerate overnight. Remove sides of pan. Refrigerate leftovers. Yield: 12-14 servings. Your Cheese cake is just beautiful. I would like to invite you to bring a dish to my Full Plate Thursday. Thank you for sharing and have a great day! This is oh so sinful! You're going to create a monster in that beautiful child of yours!!! Anything with PB is a treat but with the crumbly candy top, the veil has descended! Popping over from FTLOB tasty tuesdays. Have a brilliant day. ohmyword! two of my favorite things....cheese cake and peanut butter cups!! My tummy and I often have similar conversations! :) Cheesecake would win any day! This looks AMAZING! Oh. My Goodness. 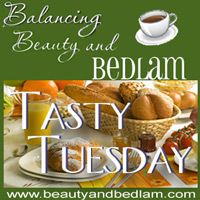 Hi, I am joining in “The Tasty Tuesday Blog Hop” and I am following you now! This PB Pie looks so yummy and I know my hubby would love it! If you are able, I would love a follow back. Thank you! Oh my, I don't even know what to say! Even though it's called cheescake, I think of it more as pie too. And what a pie you have here! I would absolutely LOVE this cheesecake~dangerously so:) WOW! Just Stopping by from TMTT. That looks almost sinful to eat. i ate at the Cheesecake Factory this past weekend and even their PB cheesecake did not look that good. ummm... delish! While I'm here I wanted to invite you to check out my Iron Chef Challenge This month's themed ingredient is canned tomatoes, so link up a recipe using those and you could win a prize. It should be a lot of fun, hope you can join us!! This looks so amazing! I am going to HAVE to try and make it, my husband and oldest daughter could love off of a peanut butter diet!! After eating this I may give up all other food!!! This looks delicious and not too hard to make! Thanks for sharing. I'm going to make it this weekend b/c my bday is on Mon - figure I should treat myself!! This looks absolutely divine! I love your presentation with all of the chopped reeses on top!